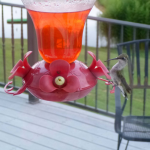 American Press Travel News–Jan 10th, Barb and I were on the road again!! The Orchard Inn is the best B&B with the best dining opportunities we’ve experienced in over 250-visits to other great B&B’s. Did you have leftover vacation days last year? Did you wish you had taken more time to relax and reset? You may not be able to pack up and leave this instant, but you can make your reservations and plan an incredible getaway for the year to come! Start the New Year off right by reserving one of our stunning suites, charming cottages, or cozy rooms in the Western North Carolina mountains. That way, you can ensure you won’t arrive at the end of the year wishing you had traveled more! If you have any questions related to your stay at The Orchard Inn, please give us a call at (828) 749-5471. 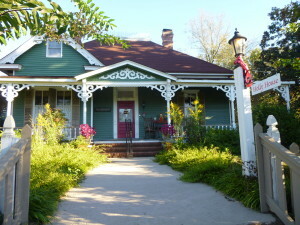 You may also reach us via email at innkeeper@orchardinn.com. Cabin Creek Trip to Sulpher Well, KY.
Fine meeting place for outdoor cooking events. Very family oriented and fun for all. The old cook shed is festooned with old tools of the past. From 1902 until 1969, Sulphur Well, Kentucky was a famous destination for people wanting to visit the Beula Villa Hotel. The resort was well known for its food and other local amenities including an Artesian well the town was named for. Drilled in 1848, the well has flowed continuously and is still visited by tourists traveling along Kentucky 70. Outdoor over wood cooking is what’s it all about!!! When the hotel closed, the small town of Sulphur Well almost faded away but the community was far from giving up. The South Fork of the Little Barren River runs through the town. A park was established on the bank of the river accenting the old well. The towns old general store is still in operation. Some years back, the Lighthouse Restaurant was opened and has become a destination for many travelers who enjoy the large servings of catfish, chicken and other dishes served country style. 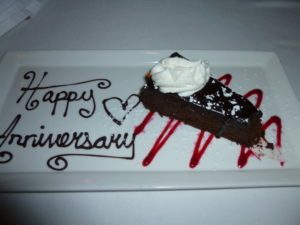 It was recently voted the second best non-franchised restaurant in Kentucky. Our main reason for our overnight trip to this small Kentucky community was the lodging at Cabin Creek. Although we live only a few miles from Cabin Creek, we decided to spend the night and get a feel for the place. Many times, our house is full during family gatherings and other events, so I wanted to be able to recommend other lodging options for our friends. We were very pleased. 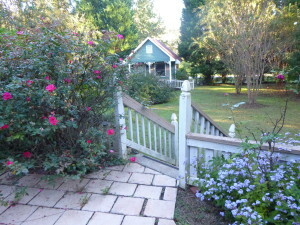 Cabin Creek is the perfect setting in this historical town. Long-time resident Dean Rowe started the project 15 years ago when he moved an original 1820s log cabin to the 11.5-acre site next to the River. Rowe said, “we have period correct furnishings, but you will find modern conveniences with electric and running water”. Everything is hidden away unless you open one of the kitchen cabinets where you will find a coffee maker, microwave, and toaster oven. The old claw foot tub in the bathroom is a nice touch but antique or not I still prefer a hot shower adding to essential items I rank as necessary. Even with these modern but hidden amenities, you get the feel of living in the early 1800’s with the fireplace or waking up to water flowing through the riffles of the adjacent river. Smallmouth bass and rock bass or as they are called around this area, “redeyes” are abundant in the river. 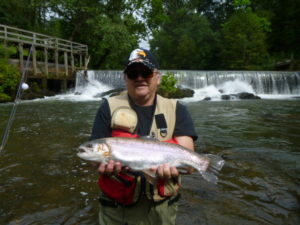 In addition to the South Fork, there are at least six additional access points for kayaks or anglers who prefer wading for bass and redeyes. With over 11-acres of land, birders will find a nice mix of birds throughout the spring and summer months with numerous neotropical migrant songbirds. Watch for the orchard oriole, summer tanager, eastern phoebe, or listen to the chattering of one of many resident belted kingfishers flying along the river. 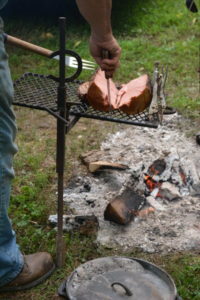 There is also an early blacksmith shop on the grounds, also constructed of half dovetailed logs and other buildings with antique farm equipment and many items to view and photograph. Rates for Cabin Creek is $80 for two and $15 for each additional person. The cabin will sleep from five to seven. 12 Days of Christmas and we are excited to announce our 12 Days of Christmas! Each special will run on the day listed from 9:00 am until midnight. You must call 865-376-0113 to take advantage of each special. If you would like to receive a reminder email each day for that special please click the link at the bottom. December 1- 10% off all Gift card orders. December 3- King size Comfy Sheet set for $135 plus tax and shipping or free pickup at Whitestone.December 4- Dinner for 2 and a horse drawn carriage ride for $115 plus tax and service fee.December 5- A private 3 hour cooking class with one of our fantastic chefs for $135 plus tax and service fee.December 6- Anniversary add on package for $75.00 (Reg price $100)December 7- 10% off all Gift card orders.December 8- Winter Weekend getaway, Book any 2 night weekend stay for $399 plus tax and resort fee. (Includes breakfast for 2 each morning)December 9- King size Comfy Sheet set for $135 plus tax and shipping or free pickup at Whitestone.December 10- $295 for a one person entry to a Living Waters Retreat (Reg price $395)December 11- Dinner for 2 and a horse drawn carriage ride for $115 plus tax and service fee.December 12- Bonus Bucks on all Gift Card orders……. Yes, email me with each new special! Come enjoy an intimate evening with Gordon Mote. Gordon is an award winning southern gospel artist and pianist. Blind since birth, Mote’s faith provides the foundation for his life and constantly fuels his creative spirit.You can read more about Gordon here. Join us for a special performance in The Chapel of The Good Shepherd on Tuesday December 18th at 7:45 pm. Call 865-376-0113 to purchase your tickets. You may also make dinner reservations at 6:30 before the concert. Prices are as follows…. APtravelnews – October 15th-Hamilton, GA. When we pulled in to the Holly House in the small town of Hamilton, GA. (20-miles from Columbus) we entered this truly fine home between two giant 100-year old Holly bushes. Close by the other side of the front steps stood a huge Magnolia Tree, almost ready to bust out in giant fragrant blooms. The landscaping helped frame this 6000-square foot, in the folk Victorian style home, perfectly! 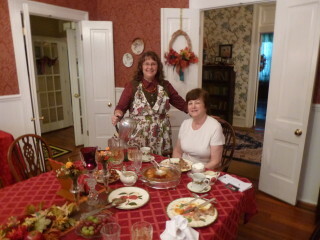 Barb and I entered the front door and were met by Judy Archibald, our incredibly sweet and friendly owner/hostess. Little did we know the treat that awaited us? 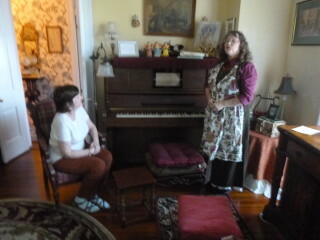 The home was decorated with a wonderful selection of antiques and vintage clocks and church organs, a player piano that Judy; quite professionally and beautifully sang to the tune of that 1910 song; “Let Me Call You Sweet Heart”; that to a person with a nostalgic bent, would bring tears to the eyes (it did mine, remembering all my departed loved ones) of anyone who remembered the sweet pastel views of their past happiness during their formative years with their families and friends, mostly now departed. The themed rooms all lent an air of relaxation and simple, quiet contemplation of the real meaning of life and all that it truly encompasses. A bit like a fairy tale, the Holly House B&B was so nostalgic! We’ve visited dozens of B & B’ over the past 20-years, both privately and professionally as B&B reviewers and travel editorialists. Only a few of these are remembered with fondness. The Holly House, with everything it engendered, by far has been the best overall experience of any of the past visits we’ve made all over the south and northern parts of the USA. Just meeting and hearing Judy sing would be enough for a visit! In 1992 the ceilings were lowered and the home made a perfect, now two-story, 6 suite room B & B with a music parlor, the Salute to Liberty Room, the all important gorgeous dining room, two kitchens and is located near Callaway Gardens, and behind a very historic courthouse. 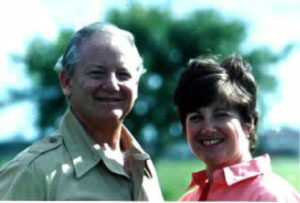 In 2011 Don & Judy Archibald from Manhattan Beach, CA. bought the 1880, totally remodeled in 1992, Holly House and love all that it means to them, their children ( their children and grown and do not live at the Holly House) and their guests. Each guest room is uniquely named and furnished such as the “Victorian Countryside room”, the “Holly’s Haven”, the “Inspired by nature” where we slept for a night, the “Walton Romance Room”, the “Journey Suite” and the “Holly Room. “There is a billiard room, a library and just behind the property a nature walking path meanders through the wood and glade. The location is 20-miles North of Columbus, and 85-miles South of Atlanta. 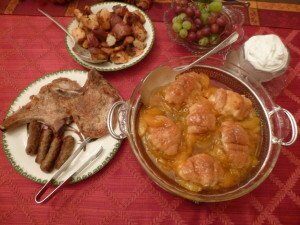 Our breakfast, one of the very best ever, featured a giant peach cobbler made with peaches stuffed into Croissants. Eggs and pork chops, great coffee and of the garden Rosemary, roasted potatoes-WOW! 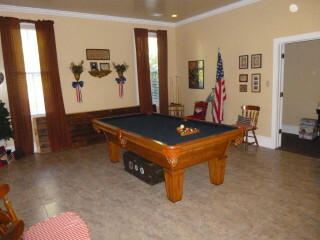 The billiard room was the Military remembrance room too! And eggs too! Stuffed Croissants with delicious peaches, incredible pork chops, taters with out of the garden Rosemary. No I’m not making it up. Judy had a voice like an angel!